Any New Hampshire FSJ guys out there? I'm moving to Southern New Hampshire. Does anyone else live in that area? Re: Any New Hampshire FSJ guys out there? Anyone in Mass, Vermont... Maine? Sorry Pal, you're about 4.5 hrs north of me. We have a nice little group here in NJ and we host 4~ events a year that you'd be more than welcome to attend. Hey! I'm just west of Boston but have family in southwestern NH, close to Brattleboro, VT. In the middle of southern NH, there's New England Dragway in Epping, which I try to get to a few times each year. Southeastern NH has Portsmouth, a beautiful coastal town we visit now and then too. A few years ago a few of us would meet once a summer in Colebrook, CT but I haven't been to that meetup in a few years. It was organized on ifsja. It will be great to have another FSJ'r in the northeast. Welcome! I'm glad to hear that there's a couple FSJ guys out there... I was starting to get worried! So, I'm hitting the road early next month and start my job at the end of the month. Once I'm settled in, I'd love to meet some of you guys in person. Twisted Frame, do you mind me asking what town you're in? I'm in Brookline, right next to Boston but we come up to Keene, NH to visit family every couple months. I've never brought my J4000 up there but that doesn't mean I wouldn't do it! twisted frame wrote: I'm in Brookline, right next to Boston but we come up to Keene, NH to visit family every couple months. I've never brought my J4000 up there but that doesn't mean I wouldn't do it! So you'll be about an hour from the area I'm looking at. I see potential for a meetup! Looking forward to it! Good luck with your move. Thanks! I'll post up when we get out there and are settled! According to BostonBob you'd better get a daily undercarriage wash. If there aren't enough FSJ guys out there I'm sure you'll find someone to wheel with. Are you going to make it this saturday? I'm finally settled here in Mass. for the time being. Still looking for houses in NH but haven't locked into anything yet. Thanks for the great information, BostonBob. Eastbeast and Twisted Frame: You guys interested in just getting together and grabbing dinner some time? I'd love to meet some locals. Hey there - I forgot all about this thread. I'll PM you. Thanks for the PM, twisted frame. I look forward to meeting you. Awhile back there were regular meets in Connecticut at a dam. Day event headed by Mikel with the 6X6 M715. Awesome group of guys from Massachusetts, Connecticut and New HAMPSHIRE. Thanks for the info, Grand_Wag_85. 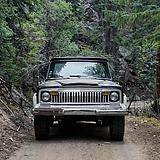 I haven't been able to connect with anyone out here yet but, it would be fun to get together with some other FSJ owners and talk shop. I'm about 30 mins south of Boston. I run a small Jeep parts store, and have about a dozen local customers in the area with FSJs. Had a vintage Jeep meet 2 years back with a decent turnout. Planned on doing one this year, just haven't got my act together or got my FSJ where I want it to be yet. Jepht20 wrote: I'm about 30 mins south of Boston. I run a small Jeep parts store, and have about a dozen local customers in the area with FSJs. Had a vintage Jeep meet 2 years back with a decent turnout. Planned on doing one this year, just haven't got my act together or got my FSJ where I want it to be yet. Thanks for posting up! Sending PM now. I'd be game for meeting up somewhere... if my radiator comes in before the snow, that is!